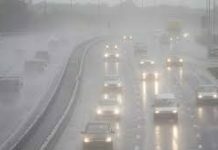 Rain-thunderstorm with isolated heavy to very heavy falls is expected at a number of places in upper Punjab, Rawalpindi, Islamabad, Sargodha, Gujranwala, Lahore, Faisalabad divisions, FATA, Khyber Pakhtunkhwa and Kashmir during next twelve hours. 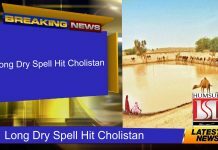 Rain thunderstorm with isolated heavy falls is also likely at scattered places in southern Punjab, D.G. Khan, Multan, Bahawalpur, Sahiwal, Quetta, Zhob, Kalat divisions and Gilgit-Baltistan. 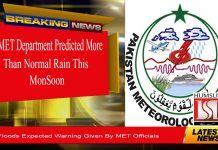 Light rain/drizzle is also expected at a few places along Sindh coast. 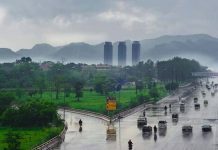 Temperature of some major cities recorded on Thursday morning was:- Islamabad twenty-six degree centigrade, Lahore and Peshawar twenty-four, Karachi twenty-nine, Quetta twenty-five, Gilgit twenty, Murree seventeen and Muzaffarabad twenty-one degree centigrade.